What is Disney CEO Bob Iger doing to celebrate the record-breaking success of "Star Wars: The Force Awakens?" He's taking his four children to see the movie -- some of them for the second time. The Iger family planned to head to a local theater on Monday, not a private screening room, so they'd better get there early. "Star Wars" ticket sales remain strong four days after the American premiere, and the movie is expected to have a long life at theaters. Igor savored the moment by giving an interview to Bloomberg TV on Monday morning. He used the appearance to announce new box office totals for the movie. "It's bigger than big," he said. "It's bigger than we thought it would be." Disney's estimates kept creeping up. Later Monday, it said the new 'Star Wars' had made $248 million in North American sales through Sunday and $529 million worldwide. Both are all-time opening weekend records. Of course, the movie was always on track to be a blockbuster. 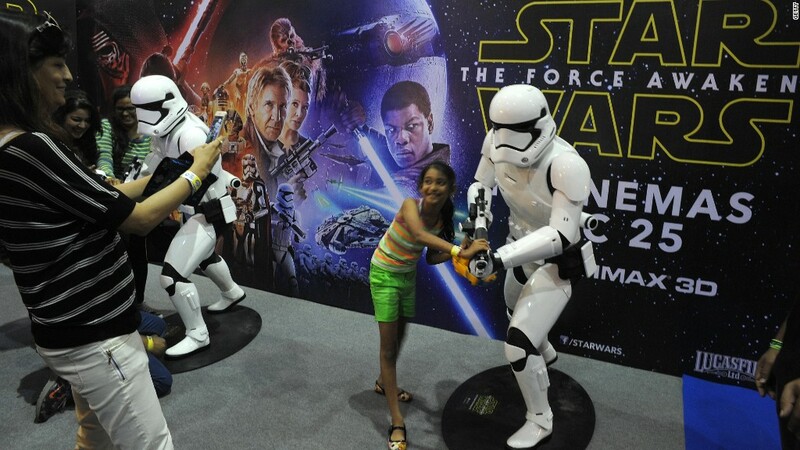 Investors aren't necessarily surprised that "Star Wars" broke weekend box office records. To some extent "Star Wars" hype is already priced into Disney's stock. Shares of Disney (DIS) -- and all the other major media companies -- have been hammered this fall. Concerns about the cable television side of the business have weighed heavily on the stocks. Disney fell about 1% Monday. But right now its movie studio is an obvious bright spot in a complicated financial picture. Iger led the 2012 acquisition of the "Star Wars" franchise and the rest of Lucasfilm for $4 billion. He said on Bloomberg that the through-the-roof results for the first new "Star Wars" film "sets this great franchise up for far more value creation over a longer period of time for the company." Several other "Star Wars" movies are in the works, "plus two big theme park lands, one in California at Disneyland and one in Florida in Orlando," he added. "And in all likelihood, there will be Star Wars lands in our other park locations around the world."